Suit was always a traditional form of men's formal clothes. Modern times, the suits have seen a huge transition. Suits as we know had a huge history to itself. Suits was usually reserved for formal and business activities, however it’s not the same now. 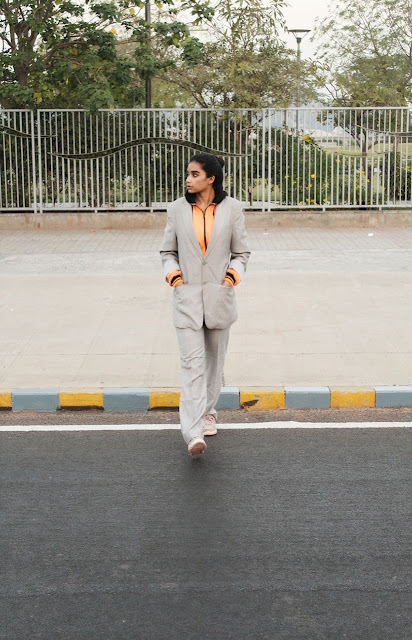 Gone are the days when the suit had to be black or navy blue, or that they had to be formal, we have all variety in suits nowadays, be it stripes, animal, snake prints or even a floral or even a co-ord. They are anything but oh so formal. 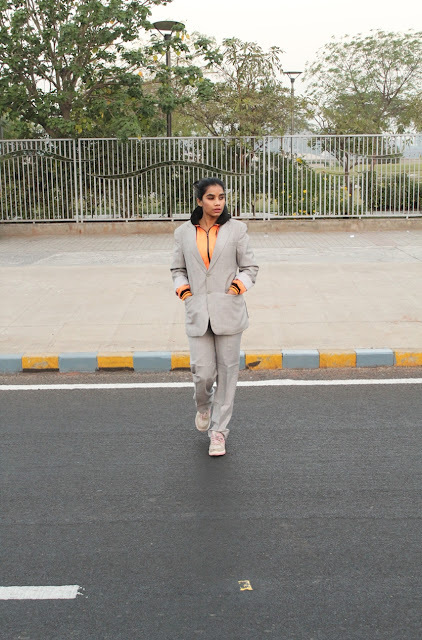 I m a huge fan of suit, both formal and informal, not Barney type craze though, I love them with bralettes, shirts, crop tops etc. During winters they make up for "FASHION FOR NEED"
Since it is winters, I could not suit up with a bralette, we can save that for summers, however for winters there are many options as well like you wear a sweater or even a blazer inside it, today I thought of clearly experimenting and doing something little more different and unique. That is all for today, do let me know what do you think of this style. This suit is so cool baby! awesome and very charming ! That is a nice match. Happy weekend! Interesting idea. Colors fits you! Real cool combination! 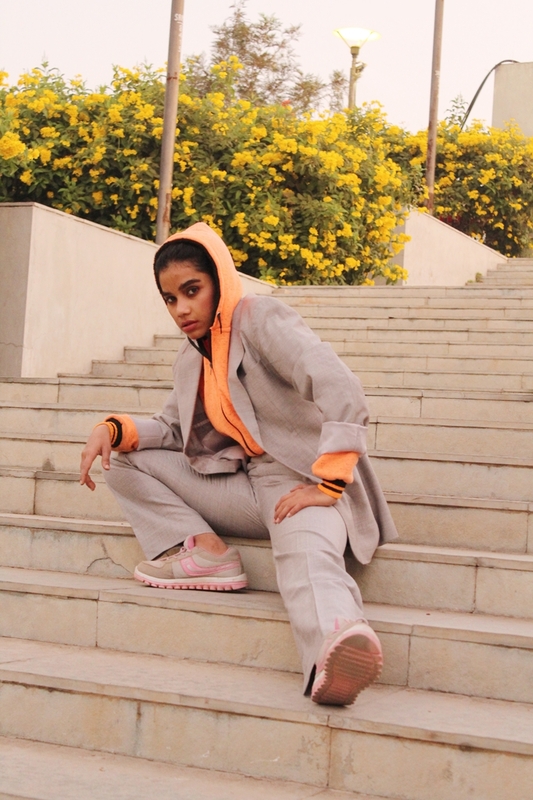 I love the suit with the sporty pieces. I like the cool casual approach to this styling. This looks cool!! Looks great on you! Such a cool outfit. You look so pretty 😍. The suits looks great on you and you look super cool too! I have been wearing more hoodies lately, but I never thought about it with my suit!! Great idea! 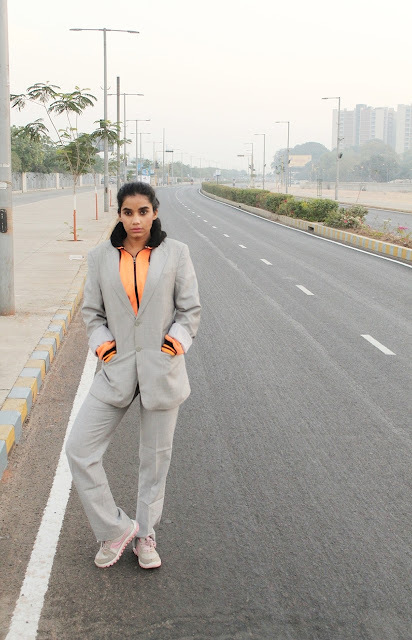 Great idea to style this suit in a more fun way. I like how you have paired it with a hoodie. You look fantastic! Lovely photos as well. I like suits too. Not as much as Barney, though. Remember that episode when he hid a suit in a toilet so that he could wear it when he needed to? This look is so amazing... Very beautiful sneakers! Have a great week. Oh I love a good suit. I have been on the look out for one for quite a while now. I hope to find one I like soon. You look great in this one. And the hoodie gives the look an edge. You are rocking this suit! The menswear vibe is very cool. Super cool outfit, dear! You look great and so stylish! And those colors look really good on you! What a great idea! I love love love this combination! Oh yes I'm pretty sure about that too :D There is always a good reason for beer. 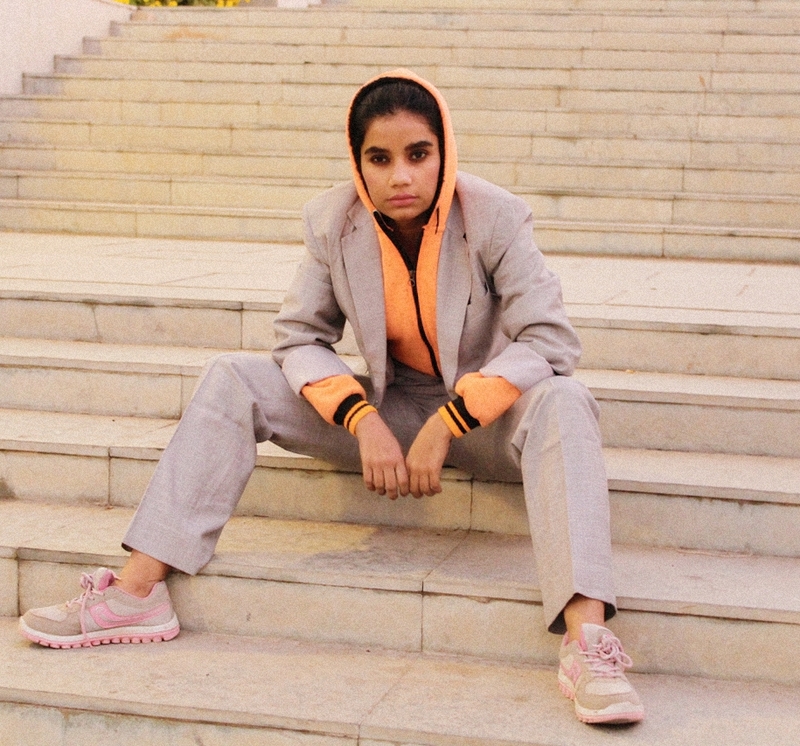 Love this- the hoodie gives this suit some serious edge. I accepted this amazing style, beautiful and comfortable. Have a great day! I love this pictures very much! I love menswear in general and that suit looks great on you. I really like the orange hoodie with it. If you want me to tell the truth it is not good on you! Hello! As I said here, I'm going to say that you have a new post there. Have a great day. I agree:suits are so stylish! And a I often prefer light colours too, especially in the cold season. The one you are wearing really, really suits you!! This is such an interesting concept. Thanks for share with us.